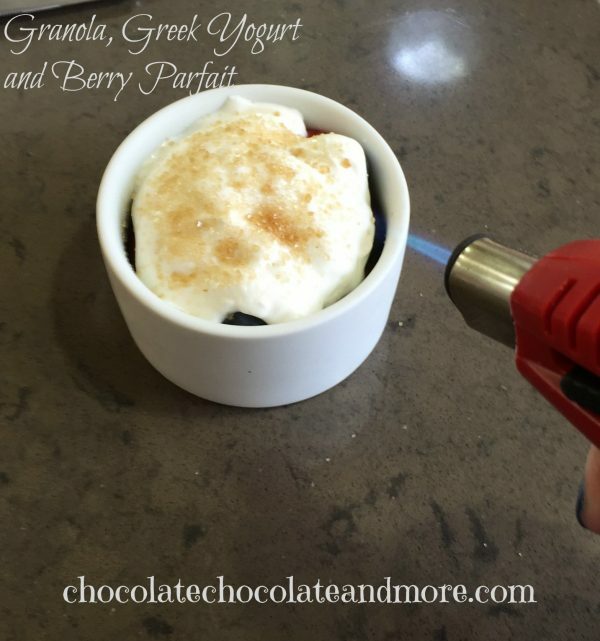 Yogurt Granola Berry Parfaits - Chocolate Chocolate and More! 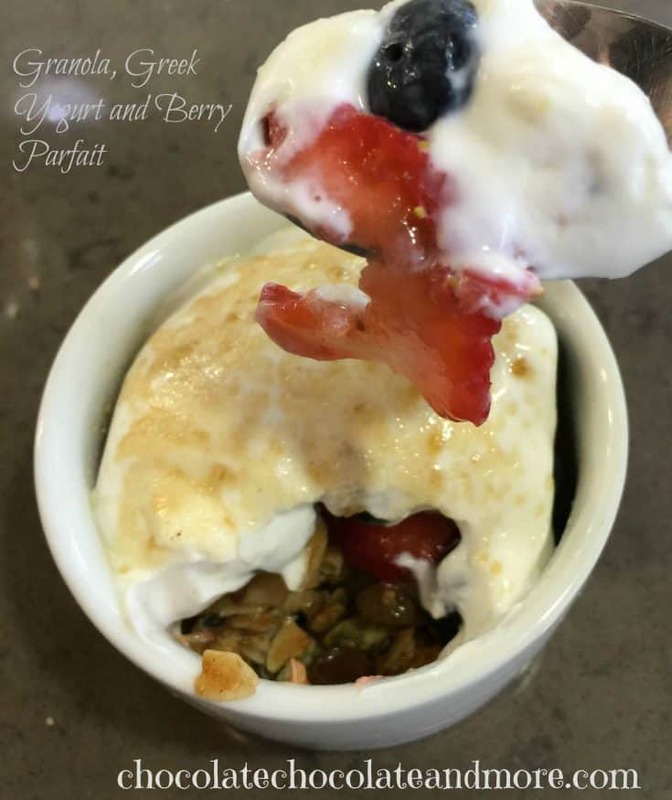 Yogurt Granola Berry Parfaits are wonderfully versatile treats — they can be eaten for breakfast, lunch, dinner, for a snack or even dessert. They are healthy alternatives to ice cream and cookies, and when you blend them together with some fruit they make a delicious combination that can be used for anything from breakfast to dessert. 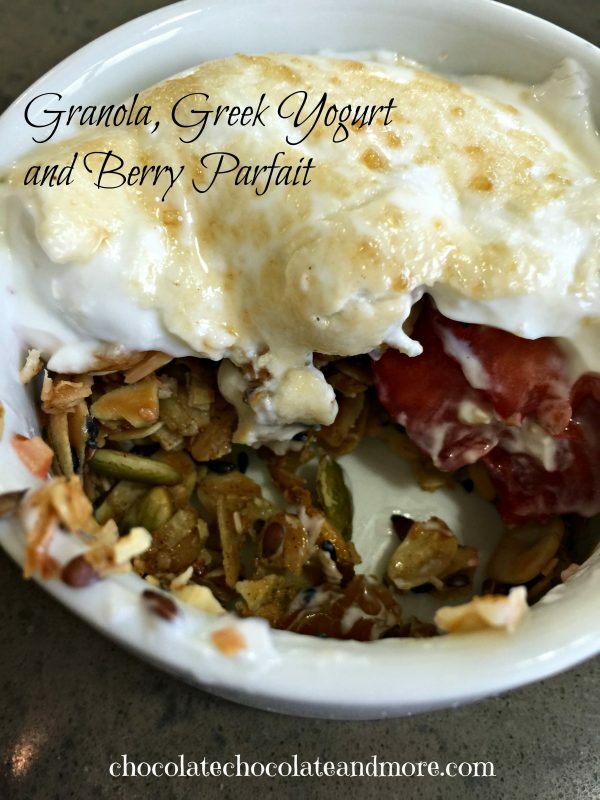 Yogurt Granola Berry Parfaits can be dressed up or down. For this version, I am going to give you recipe for home made granola; combine the granola with yogurt and berries, add a little fire, and you will have a dessert that will impress your family and friends. To make it a simple process, you can replace the home made granola for your favorite store bought granola, or another crunchy filling of your choosing. Versatility is the key! Set aside about an hour to make the granola, and about half an hour to assemble the parfait. If you have a kitchen torch, you can make this a “brûlée” by topping the end result with some turbinado sugar and a little fire. If you don’t have a kitchen torch, just top with the sugar and serve as-is. Trust me, it will taste just as good either way! After you make your parfaits, you can combine the remaining berries and yogurt into one bowl and refrigerate…and the granola can be placed in an air-tight container set aside for later snacking. The granola will keep for several weeks! Make this granola from scratch, layer with greek yogurt and berries, and you have a delicious treat you can eat any time day or night.